FAM ended its season (and maybe its run) on a slight up note. ABC: GREY’S ANATOMY (1.5), STATION 19 (0.9) and FOR THE PEOPLE (0.5) were all steady. CBS: The FAM season finale was the sole original on a night of reruns, which doesn’t speak well for its prospects. But despite the lower lead-in, FAM gained 0.1 to 0.8. 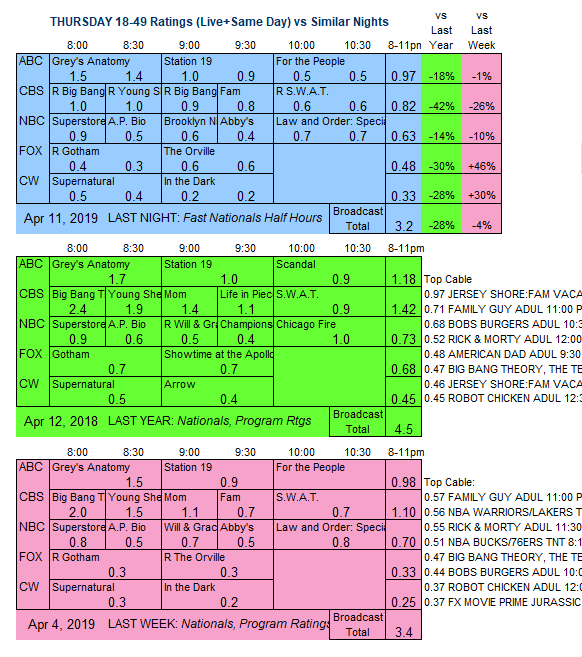 The sitcom reruns that preceded it were at 0.9-1.0, and it was followed by a SWAT rerun at 0.6. NBC: SUPERSTORE was up 0.1 to 0.9, and AP BIO held at 0.5. 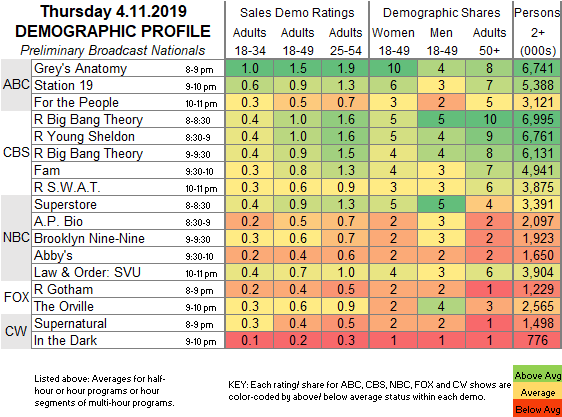 BROOKLYN NINE-NINE aired for the first time since March 21, and was steady at 0.6, but ABBY’S fell 0.1 to a new low 0.4. SVU dropped 0.1 to 0.7. FOX: After a rerun of GOTHAM at 0.4, THE ORVILLE aired its first original since March 21 and stayed at 0.6. CW: SUPERNATURAL rose 0.1 to 0.4, and IN THE DARK remained at 0.2. Tonight, ABC airs the season finales of FRESH OFF THE BOAT and SPEECHLESS. Brooklyn NIne-Nine is UP a tenth from where it finished on March 21, not ‘level’.